The Foreign Advisory Committee held its first meeting in a year on Tuesday, Dec 1, at the provincial offices in Shin Jeju. The seminar room was filled with speakers, a handful of observers and students, some of whom had come to see their professors as FAC members. The seminar began promptly with Kang Yong-seok, director of construction and transportation at Jeju Free International City, apologizing for the absence of busy Jeju governor Won Hee-ryong. The first guest speaker was Amanda Poulin, a teacher at the Jeju Foreign Language Learning Centre. She outlined the problems faced by foreigners when they move to a new country and seek to interact with the local community. Poulin stressed that although the language barrier is a large obstacle to overcome, it is not the only one faced. Fear, misinformation and impatience from both sides affect dealings with local people. She also made suggestions for how to work together to overcome these obstacles by not only being courageous, but by being more informed and patient with one another. The second guest speaker was Dr. Park Ho-nam from the National Institute for International Education. 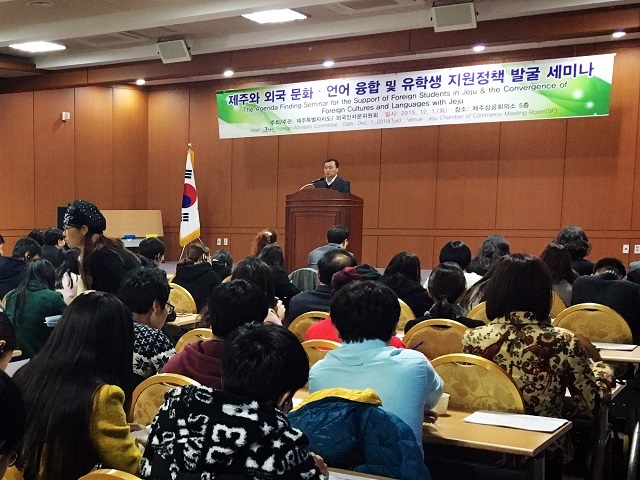 Park spoke about his years of experience trying to encourage more foreign students to study in Korea and the Institute’s plans to further increase their numbers. He acknowledged, however, some systemic problems for international students coming to Korea including: inadequate housing; insufficient access to counselling; poor information provision; and a lack of clarity on labor rights for students and their families. Park stressed that his Institute is working hard to tackle these issues so Korean becomes a more desirable overseas study destination. He concluded his talk by playing familiar Chinese songs with two Korean wind instruments, the danso and sogeum, as an effort at cross-cultural fusion. After the presentations, panelists introduced their ideas on how to address the key issues for foreigners and foreign students living, working and studying in Korea. After all of the panel presentations, Director Kang gave his brief responses to the areas of concerns, although these seemed inadequate as many of the issues are out of the hands of the Jeju local government. Although the lack of student participation was disappointing (many slept throughout) the Foreign Advisory Committee now has a concrete agenda to pursue in the remainder of its term.